Allentown, Pa., June 13, 2017—The Lehigh Valley Community Foundation (LVCF) recently honored Bruce A. Palmer, CPA with the 2017 Service to Philanthropy Award. Palmer is the Managing Shareholder of the Bethlehem office of Buckno Lisicky & Company. He is a member of the LVCF Board of Governors. 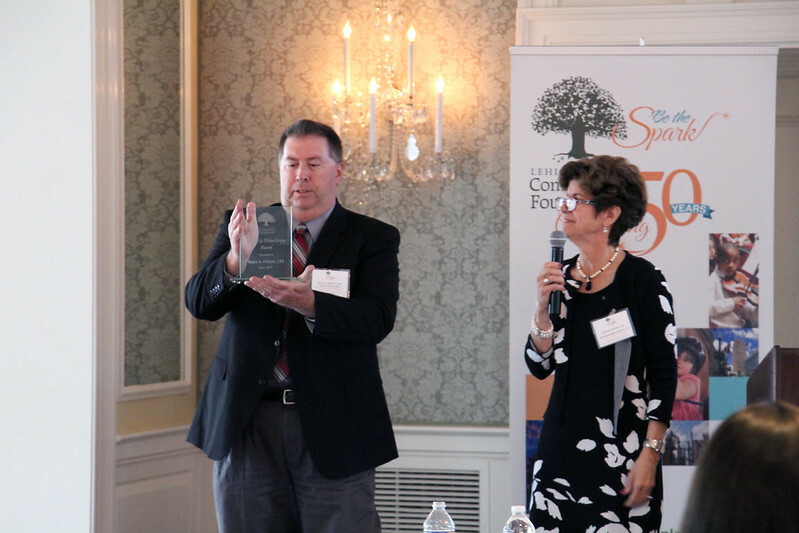 Each year, the LVCF recognizes professional advisors with the Service to Philanthropy Award. This award recognizes a professional advisor who inspires philanthropy in the community, and understands the diverse advantages of charitable giving for his clients, and the value of philanthropy in estate, retirement, and wealth management planning. Recipients of this award are chosen because they have matched their clients to the Foundation for philanthropic purposes. The award was presented to Palmer by Dolores Laputka, Esq., of Norris McLaughlin and Marcus P.A., which was the Award Sponsor. Laputka, a recipient of the award in 2007, is the Chair of LVCF’s Professional Advisors Council and a strong supporter of the Foundation. Palmer has deep roots in the Lehigh Valley. His involvement in the Lehigh Valley community is extensive. In addition to being a member of the LVCF Board of Governors, Palmer is a past president of the Bethlehem Rotary Club; Vice Chair of the Board of Trustees of Northampton Community College; President of the Board of Directors of the Boys & Girls Club of Bethlehem; past Chairman of the Board at Historic Bethlehem Museums & Sites; and Board member of Moravian Village of Bethlehem. Palmer has been recognized as a 2017 Northampton Community College 50th Anniversary 50 Programs & Fields honoree; 2015 Historic Bethlehem Holiday Dinner & Auction - Individual Honoree; and the 2009 United Way Campaign Rising Star Award. A graduate of Bangor Area High School, Bruce received an Associate’s degree in accounting from Northampton Community College and a B.S. degree in business with a concentration in accounting from Kutztown University of Pennsylvania. Recent winners of the award in include Geoffrey Boyer, CFP, Boyer Financial Group in 2016; J. Marshall Wolff, Kressler, Wolff & Miller in 2015; Matthew Sorrentino, Esq. ; Norris McLaughlin & Marcus, P.A. in 2013. See the LVCF photo album below from The Lehigh Valley Community Foundation seminar for professional advisors, "Washington Update: An Inside Look at Politics and Philanthropy," on that was held on Wednesday, June 7, at the Saucon Valley Country Club. Hadar Susskind, senior vice president of Government Relations, Council on Foundations, presented the latest actions in nation's capital affecting the philanthropic community. The Community Foundation presented its prestigious Service to Philanthropy Award to Bruce A. Palmer, CPA, Buckno Lisicky & Company.